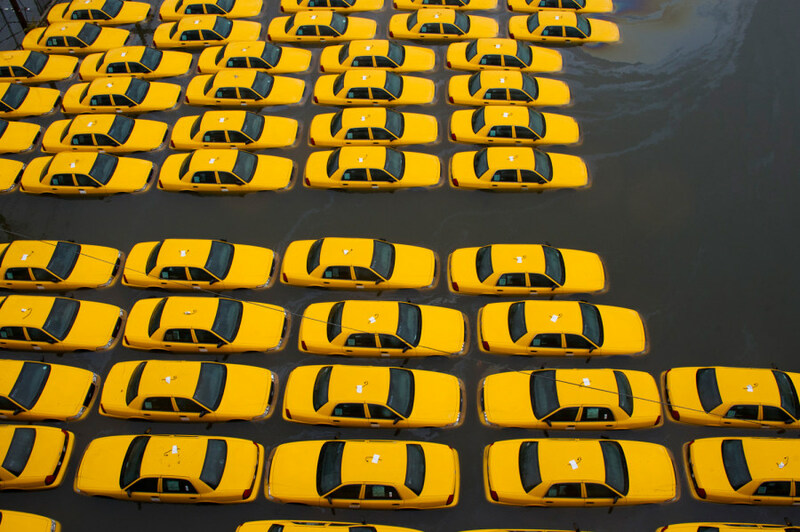 A parking lot full of yellow cabs is flooded as a result of superstorm Sandy on Tuesday, Oct. 30, in Hoboken, NJ. 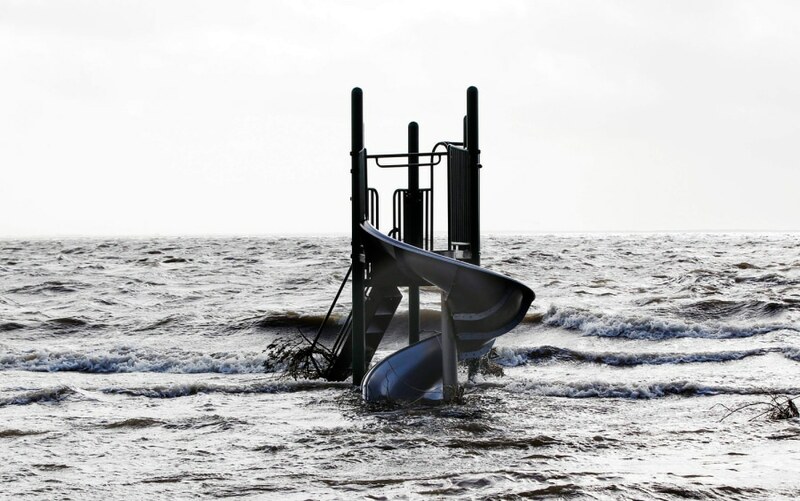 A playground apparatus stands surrounded by water pushed up by Hurricane Sandy in Bellport, New York, Oct. 30. 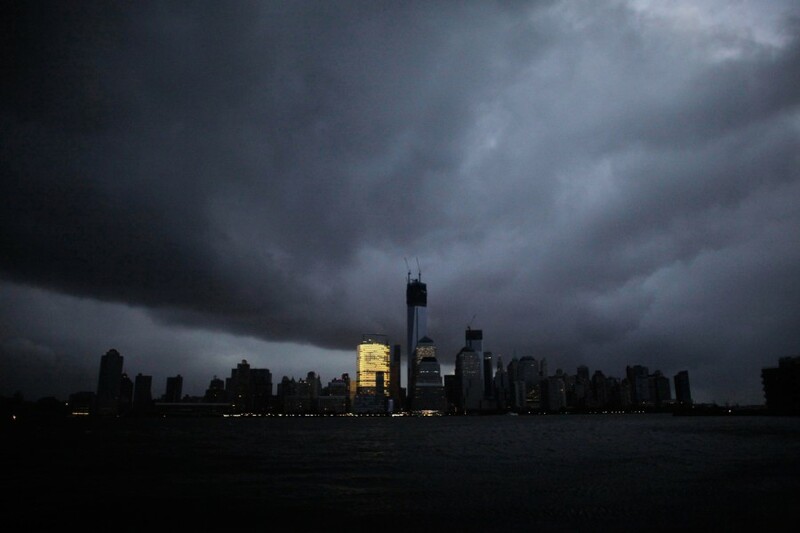 A general view from Exchange Place shows the skyline of lower Manhattan in darkness after a preventive power outage caused by giant storm Sandy in New York on Oct. 30. 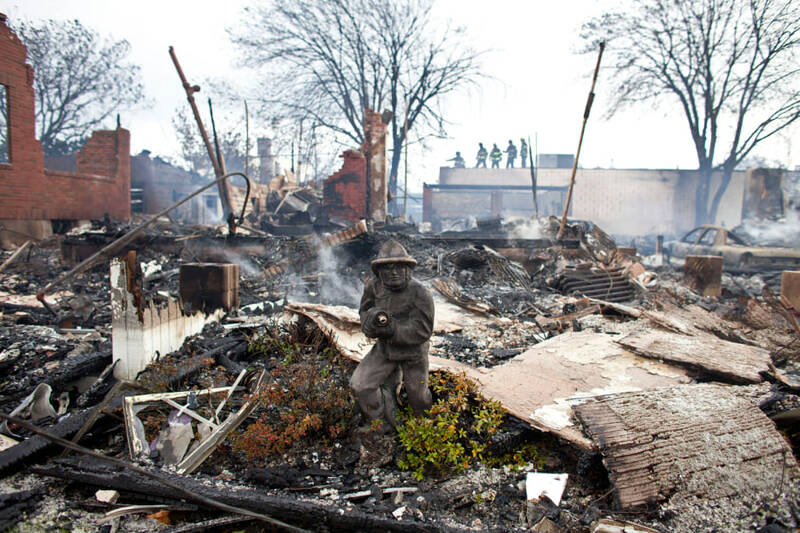 Burned down houses after a fire caused by Hurricane Sandy, in Breezy Point, Queens, New York City on Oct. 30. 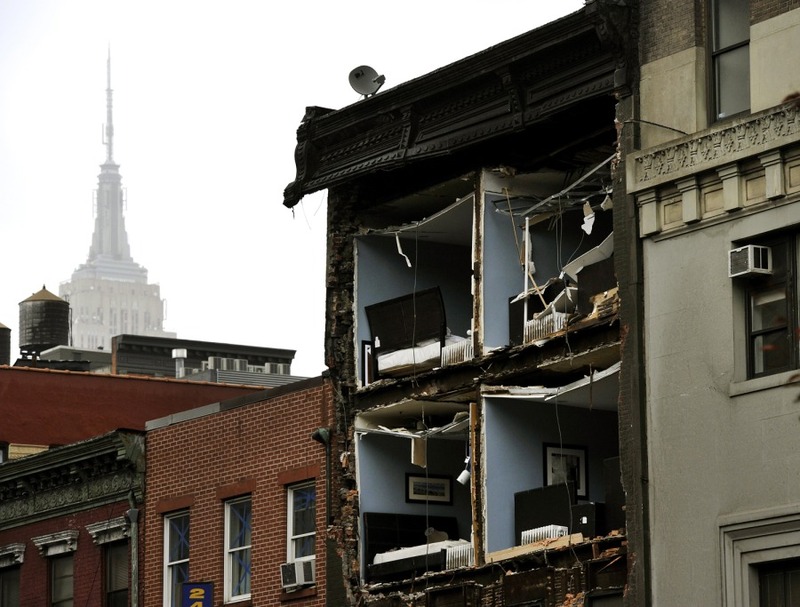 The Empire State Building towers in the background of an apartment building in Chelsea, New York City, with the facade broken off on Oct. 30, the morning after Hurricane Sandy. 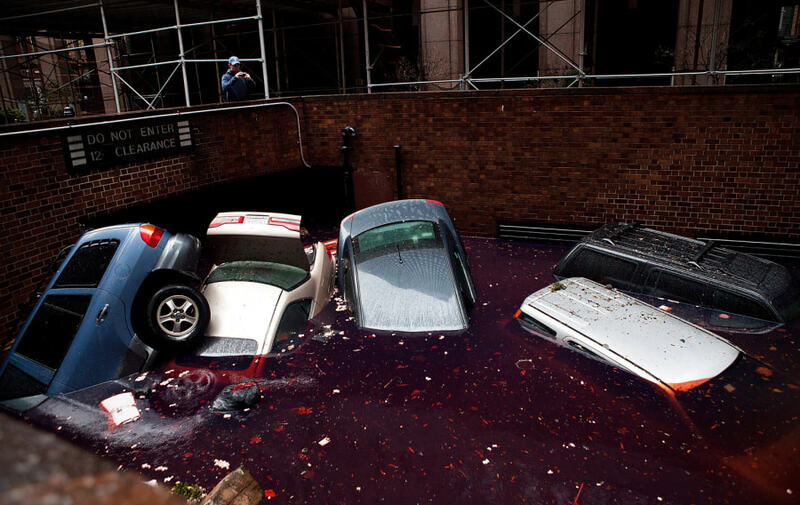 Cars floating in a flooded basement following Hurricane Sandy on Oct. 30 in the Financial District of New York City. 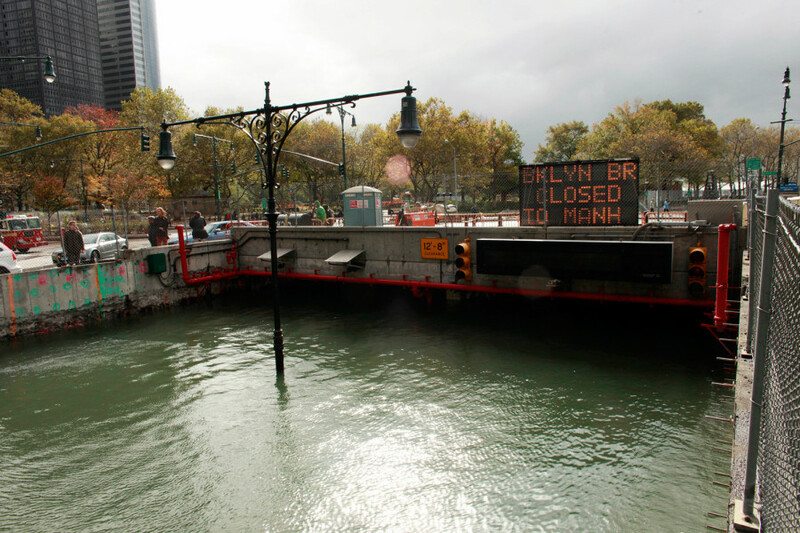 The Brooklyn Battery Tunnel is flooded after a tidal surge caused by Hurricane Sandy, on Oct. 30, in Manhattan, New York. 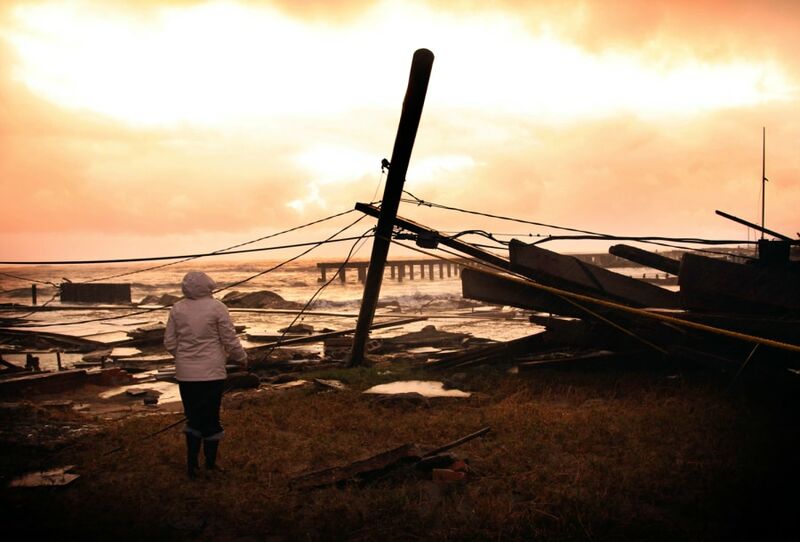 Kim Johnson looks over the destruction near her seaside apartment in Atlantic City, N.J., on Oct. 30, Sandy, the storm that made landfall Monday, caused multiple fatalities, halted mass transit and cut power to more than 6 million homes and businesses. 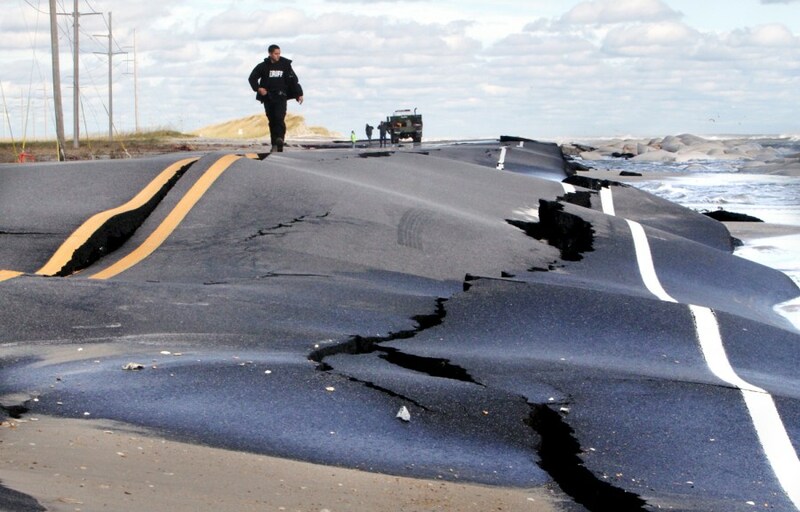 Deputy Cliff Tice of the Dare County Sheriff's Department walks down damaged and impassable NC 12 leading into Mirlo Beach in Rodanthe, N.C. on Oct. 30. 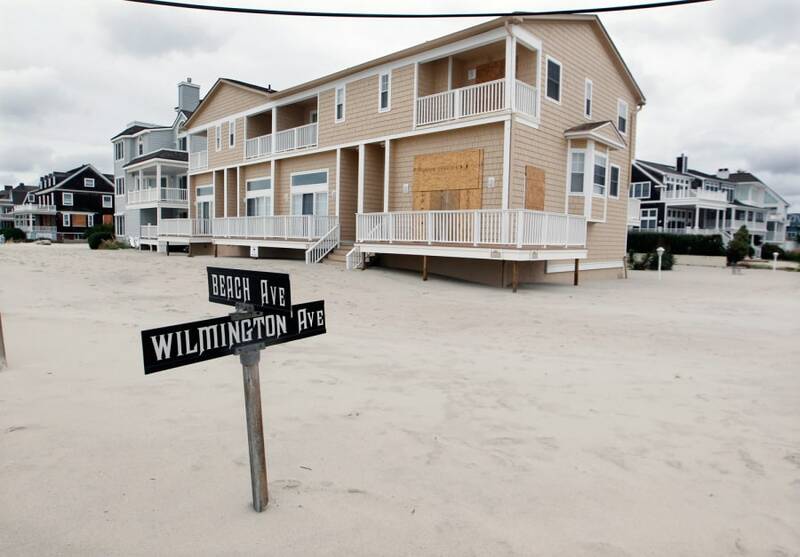 A street sign is partially buried in sand Tuesday morning, Oct. 30, in Cape May, N.J., after a storm surge from Sandy pushed the Atlantic Ocean over the beach and across Beach Avenue. 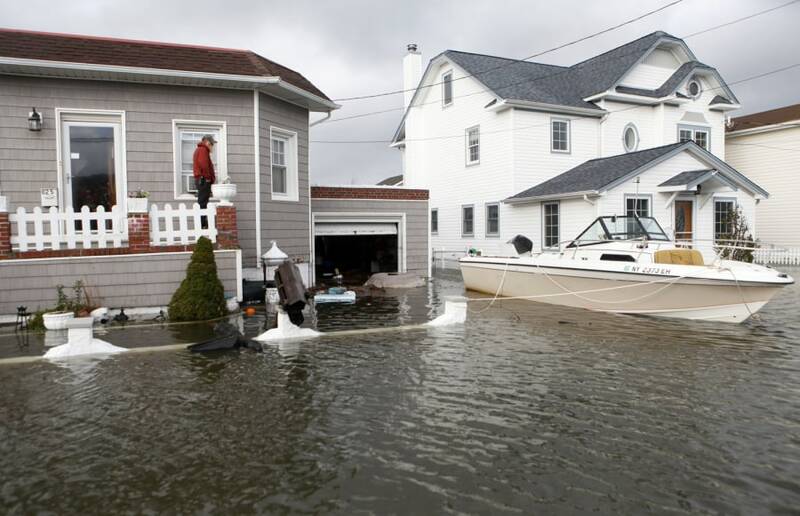 A boat floats in the driveway of a home in the aftermath of superstorm Sandy, Tuesday, Oct. 30, in Lindenhurst, N.Y. 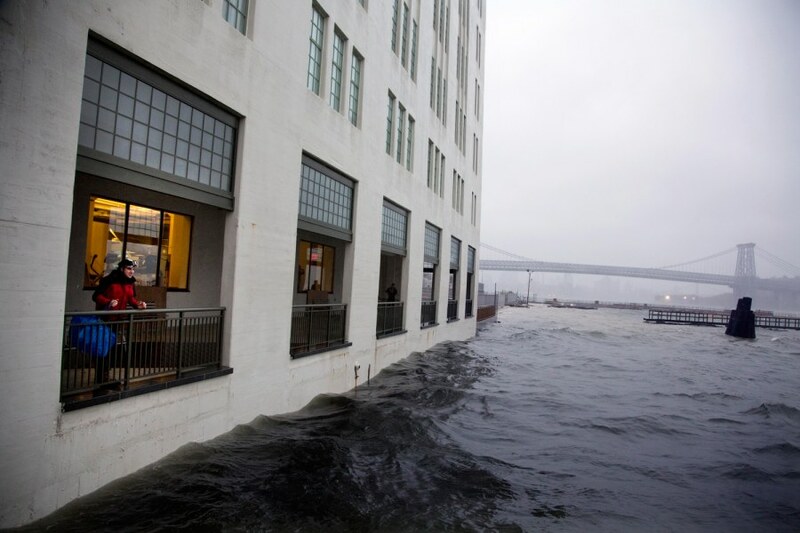 Looking out the high water in the Williamsburg neighborhood of Brooklyn after Hurricane Sandy caused extensive damage in the area on Oct. 29 in New York City. 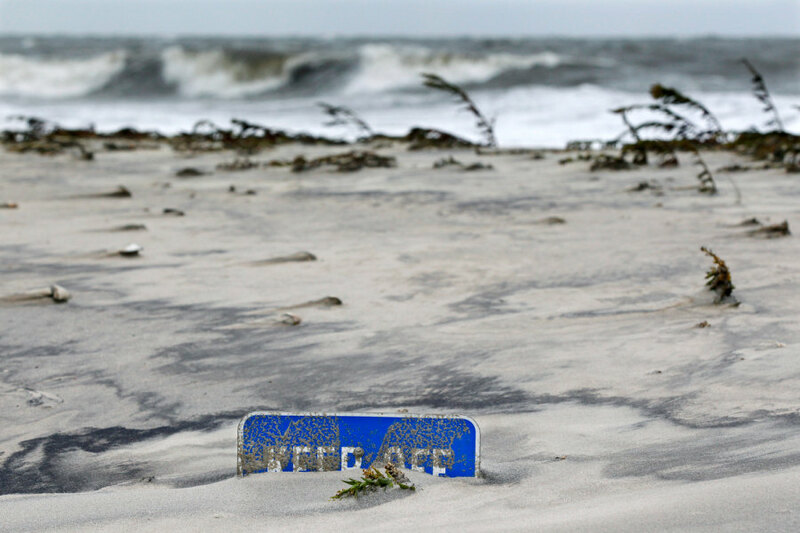 A keep off the dunes sign is buried Tuesday morning, Oct. 30 in Cape May, N.J., after a storm surge from superstorm Sandy pushed the Atlantic Ocean over the beach and into the streets.